Scam Alert: Virginia Bankruptcy Filers Targeted By Scammers! Virginia bankruptcy filers in both active or discharged bankruptcy cases are being targeted by telephone scams. In the past week I have receive two complaints from clients about “supposed” creditors attempting to force them to pay debts included in their bankruptcy. The scammers are pretending to be creditors and threatening criminal action if the debt is not paid. Below are the two scams that were reported last week. I have changed the names of the involved to protect the innocent. Last Saturday I received a call from distraught Mrs. Smith who claimed a person from our office had just called and told her she must pay a debt in her bankruptcy or she may go to jail. Yes, that is right. The scammer pretended to be an employee of our office and the caller ID on our client’s phone gave our office name because she had our number in her phone contacts. This was very alarming for us!! Spoofing a telephone number, making it appear that the call is coming from a number not owned by the caller, is not difficulty but fairly unusual, certainly spoofing a law office phone number. This “supposed” employee claimed to work with her attorney and had the attorney’s name. He advised it was imperative she pay the debt to avoid criminal action. They told her bankruptcy does not wipeout fraudulent debt. He provided a number to call to do so. Our client called the number. A person claiming to work for the creditor demanded payment. He advised her she had until 5 p.m. to make a payment or she would go to jail. Unable to pay the amount demanded she was subjected to extremely high pressure tactics which left her in tears. Confused and distraught, she called the office back and I answered her call. After she explained to me what was going on I immediately contacted employee to see if he had been in communications with the client. He had not. By the time I called the client back with this information, she had already been contacted once again by the imposter claiming to be an employee of our office. He continued to put pressure on her to call the employee of the creditor and make a payment. After getting past the client’s tears and coming to grips with the fact our phone number had been spoofed, I attempted to have her call the supposed creditor back to get more information and offer a third-party payment in order to better determine who was doing this. She attempted to do so but the scammer would not accept any payment at that point. I assume he must have picked up that she had regained her composure and got suspicious. And that was the end of that. An important element in this scam is they called on a weekend expecting the client to be unable to get in touch with her attorney. In this situation, I received a call on a weekday during normal working hours from a former client, let’s call her Mrs. Jones. Mrs. Jones had received a Chapter 7 bankruptcy discharge over three years ago. Mrs. Jones advised that she had been contacted by the “X Corporation” a former creditor she had listed in her bankruptcy three years ago. The scammer said she worked for the “Financial Crimes Unit of X Corporation” and that our client would be arrested if she did not pay the debt immediately. When the scammer wasn’t making headway in getting the money out of our client, she transferred our client to the supposed “director” of the unit who continued to pressure her to pay with threats of criminal recourse. Despite her refusal, they continued to call her numerous times that day. Eventually, she called me and I told her it was a scam. In both cases, a Goggle search showed the phone numbers were not affiliated with any business, so I have no evidence or belief the calls came from legitimate creditors. I advised both clients the calls were scams and instructed them on how to handle them in the future. Targeting Bankruptcy Clients – There are millions of scams out there and as many target categories. However, targeting bankruptcy debtors is new and apparently on the rise. Pretend To Be An Actual Creditor – The scammer will have looked at your bankruptcy filing or credit report to find a creditor’s name to use. Your bankruptcy records are public record and available to anyone (see below). Using Available Public Information & Records – All of your bankruptcy information is online through the court’s filing system (PACER/ECF). Anyone can get access to it. The information on your attorney and his firm is also online. Urgency – Scams like good movie plots have a ticking clock. Giving you a false deadline puts you under pressure. The shorter the deadline the greater the pressure. People make bad decisions under pressure. Keep The Pressure On- The scammer will continue to harass you regularly with repeated calls or emails if you do not comply with their first attempt. This will continue as long as they feel you are still responding to their pressure. Once they sense you are not going to respond they will move on. Threat of Criminal Action – Scammers threaten their targets with going to jail in order to increase the pressure on the target to act quickly. You cannot be prosecuted for a crime simply because you owe a debt. Collection of a non-fraudulently incurred consumer debt is done in civil court not in criminal court. An example of a criminal threat from a scammer is something like “the police will be at your house or work tomorrow if you don’t pay this debt today”. Isolation – In the first example, they contacted her on a Saturday hoping our office was closed. In the second example, they contacted an old filer hoping she would not have access to the bankruptcy attorney since the case was over. They were wrong in both cases. Preying On Your Guilt – No one plans to file bankruptcy or likes it. Even though it is your federal right and the best decision to help you move ahead financially there is a certain amount of guilt. All bankruptcy filers would like to be able to pay back their debt. I am pretty sure most would like to be millionaires too. But reality is what it is. You make the best decision under the circumstance and in most cases getting a fresh start is the right decision. Don’t let a scammer make you feel guilty about your decision. We applaud your courage. Verify Everything – It should go without saying, if you are given information contradictory to what your attorney advised, you should call your attorney and verify it. If you weren’t before, you are now aware phone numbers can be spoofed. Email addresses can be spoofed. Your whole identity and mine can be spoofed. I worked undercover for the Central Intelligence Agency for many years before practicing law. They set up false identities and backgrounds as part of the job. I know how easy it is. You should be aware also. Who knows? Maybe I am not John Merna….. just kidding. Do a little detective work of our own. Type the source phone number into a Google search and see if it is associate with any business. In one of these cases Google results showed someone had reported the number as being used in a scam. Use Common Sense – I realize most readers are not attorneys but if a phone call disturbs you….it warrants investigating. Phone, email, postal mail scammers are the most common scams in the world because they give easy, untraceable access for scammers to communicate directly with you. Be on guard when using them. And no, you did not just win the Nairobi Lotto for $5 million. Delete that email immediately. Ask For Confirmation – Ask them to send you an email to confirm the following: A) Is the originating email address from the company contacting you? B) Is the email on company email letterhead or just a plain text format? C) Does the person refuse send an email? No matter how convincing the communication looks… verify it. Do Some Simple Investigation – In both cases, I ran the phone number on Google and found it was not attached to any business. If a call is legitimate, then the companies phone number better be legitimate. Phone number spoofing makes the call appear to be coming from the number but it does not intercept a return call to that number. Run the number on Google. Call the number back and see if you get the same person. Pull Your Credit Report – This is a precaution to see if there is any evidence they accessed your creditor information from your credit report. Look at the section listing recent requests. Call Your Attorney – I really am repeating #1 about verifying everything. Call your attorney. If you can’t reach him call us. How To End The Scam – Once you have confirmed or are satisfied it is a scam, call their bluff. We would like to do a “Columbo” on them (1970’s reference to a detective TV series when the seemingly distracted and confused detective always nabbed his man) but most scams originate from outside the U.S. these days. Identifying and catching scammers is not a high priority for police authorities due to the high drain on resources, complicated extradition, difficult burden of proof, and low probability of success. Any information you might gather and are able to provide may help the next target of their scam but is not likely to put them behind bars. If you are or have been a victim and have some good advice or facts you would like publicized it to help the next potential victim email the information to jmerna@mernalaw.com. If I receive enough information I will try to do a follow-up blog to alert people. You can report such scam attempts to STOPFRAUD.GOV or the Office of The U.S. Trustee. 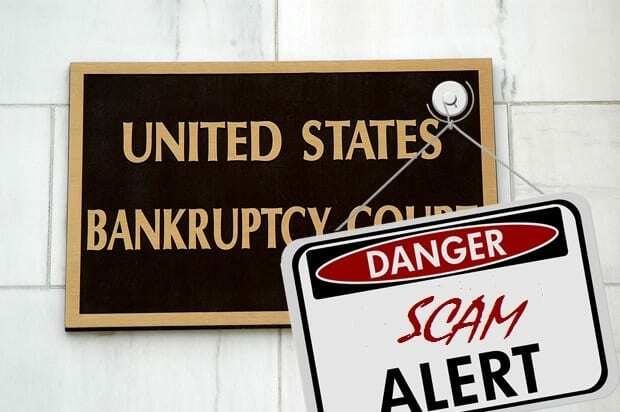 Keywords: Bankruptcy Scam, bankruptcy filing scam, zombie debt bankruptcy scam, bankruptcy fraud scam.